Are you a leader in your community, business, church, home, or workplace? Are you looking for a more effective leadership style? Leadership is often associated with power. It requires taking action that others willingly follow. In the best case scenario, there is a forward action with positive results for all. He served others instead of being served. Graciously, he showed compassion towards everyone. His words liberated instead of suffocated. He never put people down to lift himself up. Although he had great power and wisdom, he always acknowledged his source and reminded others that it was not solely him whom they were experiencing. He broke a lot of man-made rules and displayed courage in the face of wickedness. He valued truth over legalistic traditions and customs. He was a protector and defender of those less fortunate. Many people opposed him because he did not always choose a lawful or permissible option. He did not have the desire to rule over people. Instead, he taught others to love and serve mankind. His teachings were empowering, not oppressive or controlling. He did not withhold anything good from his followers. He was a trusted friend and mentor. I assure you that whoever believes in me will do the works that I do. They will do even greater works than these because I am going to the Father. He led by example instead of barking orders. Whether speaking to an outcast or a dignitary, a prostitute or high-ranking official – all who encountered Him met the same person. He built relationships. He did not compromise his moral values or integrity to fulfill the mission. He was faithful, loyal and respectful to all people. I don’t judge them. I didn’t come to judge the world but to save it. There are many leadership styles to model after, but the leadership style of Jesus has powerful results. 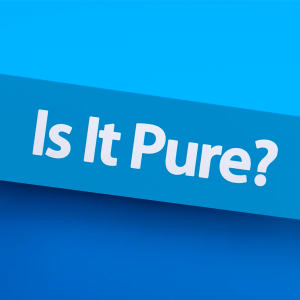 What is PURE in your life? What do you know to be real, true and clear? I have contemplated what is pure in my own life. Not my thoughts or my decisions. Unfortunately, I sometimes allow them to be mixed with external influences from the world…news, data, opinions, etc. Not my past. It has spots and blemishes. Not my body or soul. Both have been polluted with all sorts of stuff…preservatives, bitterness, foreign contaminants, pride, artificial sweeteners – you name it. Not my relationships. I am not certain all of them are genuine. Not my mouth. Left unchecked, it has defiled others and uttered words connected to doubt, fear and foolishness. Okay..then what is pure in my life? Only one thing – God. Thankfully, He cleanses me, dwells within my spirit and empowers me. His love is pure. His Word is truth. His power is real! God is the one pure thing in my life and in yours! If you want to learn more, go to Week 27: God’s Word in the Power Over All book. *Reference: “pure.” Noah Webster’s 1828 American Dictionary of the English Language. 2013. http://1828.mshaffer.com/d/word/pure (12 September 2013).